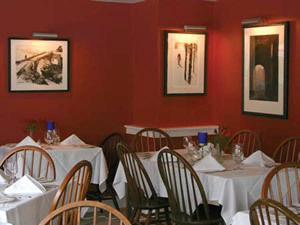 Shade length should be around one half the width of the image it is illuminating. SL Series: Stationary 8 inch arm extension. 15T4 bulbs. 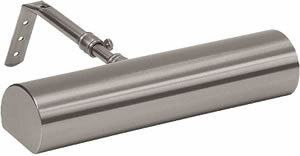 XL Series: Stationary 7 1/2 inch arm extension. 15T4 bulbs. 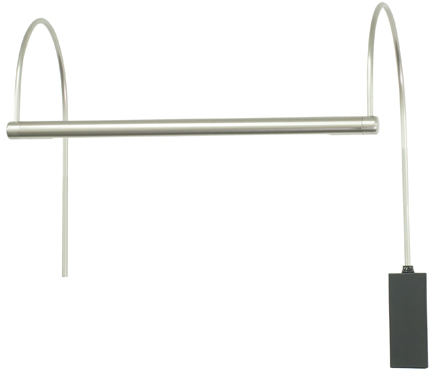 Slimline picture light with 8 foot ivory cord and in-line switch. 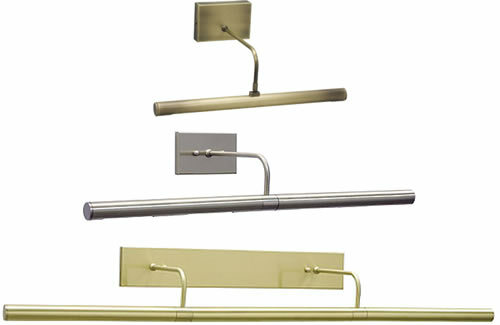 House of Troy Slim-Line Picture Lights combine sensible engineering and elegant styling with House of Troy's superior standards. Shade rotates for light adjustment. 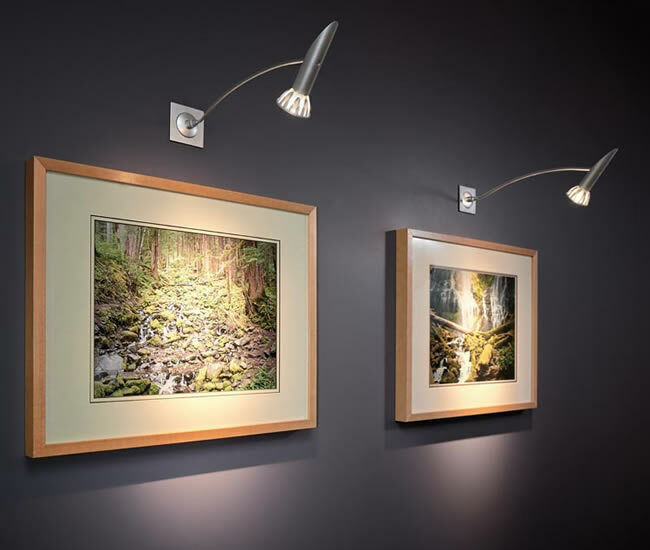 The Slim-line Series is an excellent way of illuminating without detracting from the art work. Its sleek profile emphasizes the art work and does not visually intrude. 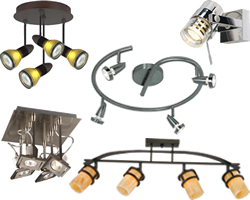 SL Lengths: 6", 11", 16", 21", 30", 40"
XL Lengths: 14", 24", 36"
Mantel light with 10 foot brown cord. Cord exits back of shade, shade swivels to direct light. 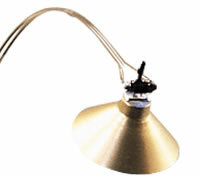 Width 14" x Height 4.5"
The Resort Display is a flexible goose neck 3w, warm 3000 Kelvin, LED task fixture. A convenient rocker switch is located on the fixture head. It is easily mounted to a single gang box and includes an integral driver on a standard switch plate canopy. The Resort Display's durable and built to last construction allows for use in demanding applications such as hotel suites or library reading tables. 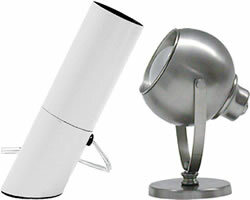 It's ideal for surface or wall mount applications and is offered in black or matte chrome finish. 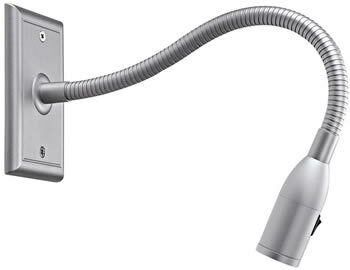 The Scorpio Wall Display mounts to standard J-box with two mounting screws. 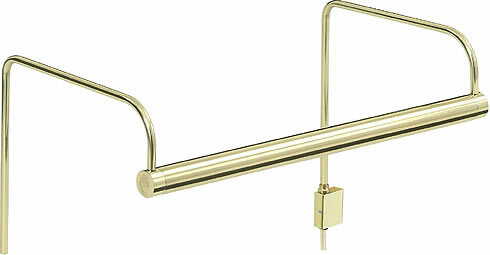 The Scorpio Wall Display fixture head is connected to a 24" curved rod. 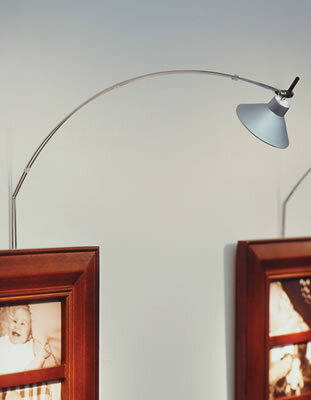 The fixture head tilts up to 100°. Integrated transformer in canopy. Horizon LED Picture Light with driver in backplate. LED 3000K, CRI 85, 220 lumens, 30,000 hour life. 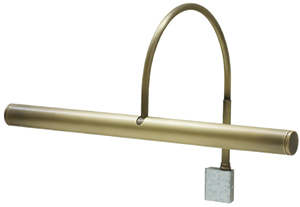 Width, Shade 12", 26" x Height Adjustable"
Base 7" x 1.5" x 1"
Mounting Option: L6 6" or L18 18"
House of Troy Direct wire picture light with 2 3/4 inch x 4 1/2 inch backplate. 7 1/2 inch stationary horizontal arm extension. Shade swivels to direct light. Sensible engineering and elegant styling with House of Troy's superior standards. 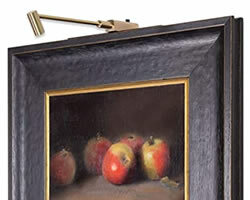 DSL 14: Width, Shade 14"
DSL 24: Width, Shade 24"
DSL 36: Width, Shade 36"
These elegant, unobtrusive picture lights are designed to properly illuminate your artwork and eliminate glare. 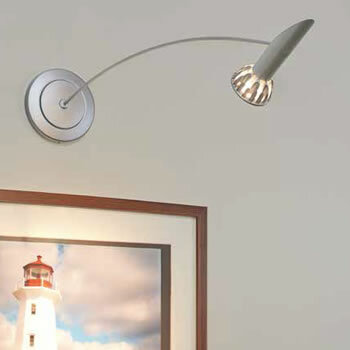 Choose a lamp that will provide the proper beam spread. By changing lamps or adding a lens, you can light an area as small as f our inches square or as large as four feet square! Both Joshua and Meg are available to plug in or junction box mount. Plug-in version has 10' cord with in-line switch and plug-in transformer. Each includes 12 volt 60 watt transformer, matching Lil Wok accessory, lens holder clip, and UV-protected MR16 lamp. Joshua and Meg junction box are dimmable with a standard incandescent dimmer. 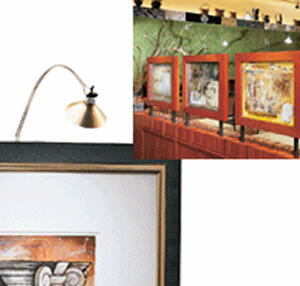 Joshua J-box and Meg J-box are dimmable with a standard incandescent dimmer. Lil Wok accessory with Snap Louver Lens Holder included. Diffusor or Spread Lens available separately. Each Meg or Joshua picture light includes a matching Lil Wok accessory, lens holder clip, and UV-protected MR16. Additional accessories may be ordered. Can hold a single lens or louver. Silver and black for MR16 of up to 50 watts. Antique Bronze for MR16 up to 20 watts only. Decorative metal shade reduces backlight from MR16. Includes Snap Louver Lens Holder. Holds a single lens or louver. Available for use on CP1, DJ-Archie, DJ-Georgi, DJ-Telescope, DJ-Wally Lite, Joshua Ceiling, K-Giro, K-Johnny, K-Pivot, K-Telescope, LC-Archie, LC-Georgi, LC-Wally Lite, Metal Man, MO-Pivot, Parachute, Swivel, Tele, Wall Archie, Wall Georgi, Wall Telescope, Wally Lite (sold separately). LED Picture Light. Line voltage, no UV, dimmable to 5% with standard dimmer, 50,000 hour lifetime.